Between the late 1960s and the fall of the Soviet Union in 1991, nearly two million Jews left Russia, Ukraine, and other parts of the Soviet Empire. Their heroic struggle for the right to worship, to learn Hebrew, and to emigrate enlisted the support of diaspora Jewish communities around the globe, especially in the United States. American Jews supported Soviet Jewry’s fight in many ways: from writing and calling individual “refuseniks,” remembering those imprisoned at Passover Seders, and “twinning” their children’s bar and bat mitzvahs with those of Soviet Jewish children who could not celebrate them, to mass rallies, protests at Soviet embassies, lobbying Congress and the administration, and actually traveling to Russia to meet refuseniks and express their solidarity. In the 1970s and 80s it seemed as if every synagogue in America had a huge poster outside of it demanding freedom for Soviet Jewry. But just as there is a myth that all Americans were united in the final struggle against communism and the Soviet Union, there is a myth about the Soviet Jewish exodus. The myth is that the American Jewish community was united from start to finish and that the power of this unity liberated Soviet Jews. There is much to celebrate in American Jewish activism in those decades, but the full story is more complex. The plight of Soviet Jewry first came into focus for American Jews in the 1960s. In 1963, the Cleveland Council on Soviet Anti-Semitism was formed. In 1966 Elie Wiesel’s The Jews of Silence: A Personal Report on Soviet Jewry, based on articles he wrote as a reporter for Ha’aretz, was published in America and became a surprise bestseller. Thirty-two local groups formed the Union of Councils for Soviet Jews (UCSJ) in 1970, and the first World Conference on Soviet Jewry was held one year later, the same year the National Conference on Soviet Jewry (NCSJ) was formed. In October 1972, Senator Henry M. “Scoop” Jackson first proposed linking trade benefits for the Soviet Union with freedom of emigration; the Jackson-Vanik Amendment became law in 1975. Anatoly (Natan) Sharansky was arrested in March 1977 and arrived in Israel only after serving nine years in the Gulag. 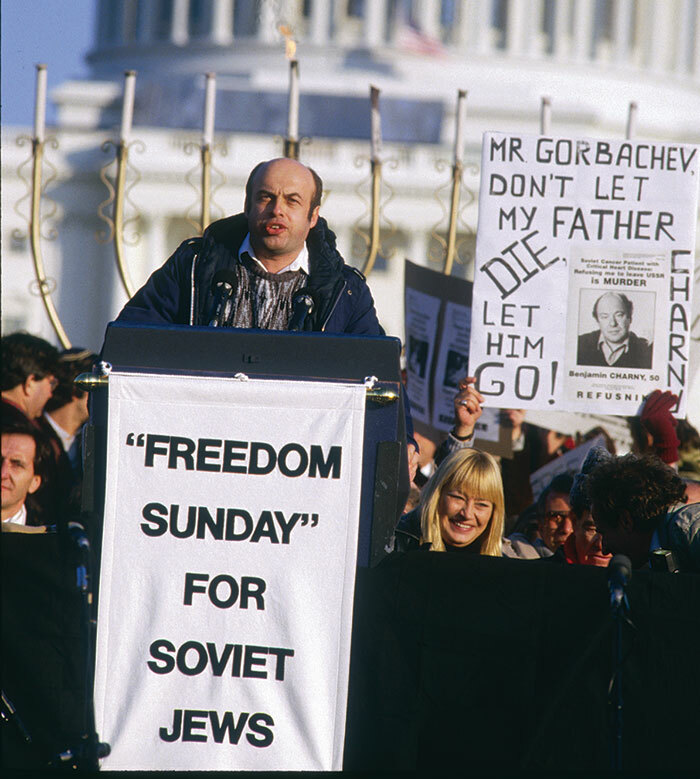 By December 1987, American Jewish support for Soviet Jewry was high enough to mobilize 250,000 people for the Freedom Sunday march and rally. As (and after) the Soviet Union collapsed, a million Jews moved to Israel from Russia, Ukraine, and elsewhere in the former Soviet Empire. In addition, another million went to Canada, Germany, and the United States. It goes too far to say that American Jewish activism achieved this; there were other factors, the greatest of which were the courage and determination of Soviet Jews. But recognizing that they (or their parents) had failed to protest effectively—or enough—for their European brethren during the Shoah, American Jews were determined to be organized, loud, and resourceful in aiding the newest victims of systemic governmental anti-Semitism. While many parties can claim a part in the freeing of Soviet Jewry, American Jews surely played a large role. It is not only a heroic story but an extraordinary historical episode worthy of close analysis. Yet there seems to be very little of such analysis, at least at the academic level. I recently looked at the course offerings of Jewish studies programs in 20 leading American colleges and universities and found not a single course about the Soviet Jewry movement. The story of Soviet Jewry and American Jewry’s mobilization to help save it is in danger of being forgotten. Were Jewish studies programs to focus on the Soviet Jewry movement in the United States, what would they find? First, the students would see that the 1960s, 70s, and 80s were very different from the 1940s, when Jews played a smaller role on the American political stage and were, in many cases, hesitant to use what power they did have. When discrimination against Soviet Jews became known, American Jews had more power and were willing to use it, as they had used it in support of the nascent State of Israel. Their numbers now included political donors and elected officials, and they had the ear of people who counted. As Yossi Klein Halevi wrote of the passage of the Jackson-Vanik Amendment, “For American Jews, it was a stunning example of their capacity to influence international politics on behalf of their people—a powerful reversal of the failures of the Holocaust.” Good arguments are critical, but there is no substitute for power and the willingness to use it. The contribution of Senator Jackson was in the fact that he was the first who made the direct linkage between freedom of emigration and very important economic interest[s] of the Soviet Union. And he did so against all the political thought in the United States of America and in the free world. Many of those people were saying, “It is our interest to have more trade with the Soviet Union, and when there is more trade there is less war.” And we, Soviet Jews, knew that our only hope to be released was that the interests of the Soviet Union, economic and otherwise, would be so closely linked to our fate that the Soviet Union would have no choice. 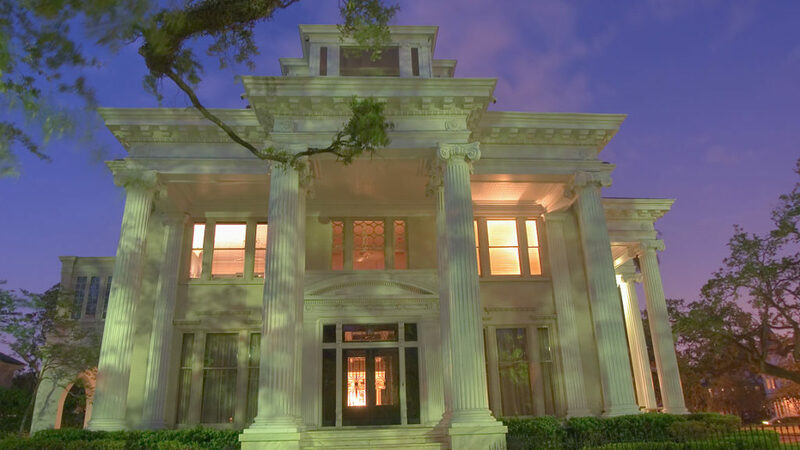 Senator Jackson was the first to understand the power of this linkage. 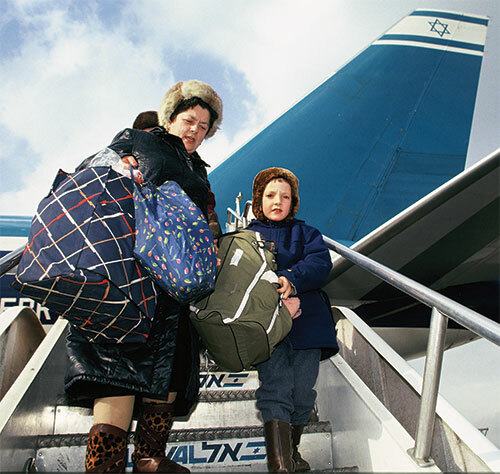 The Soviets gave ground on banning Jewish emigration when those limitations appeared to cost them more than they were worth. Governments violate human rights because they think it is in their interest to do so. Lecturing them is appropriate, but it will not force change. Jews have understood this for a very long time. After the Kishinev massacre of 1903, Jewish financiers in New York City, led by Jacob Schiff, prevented the Russian Empire from getting critical Wall Street loans during the Russo-Japanese War to pressure the tsar to stop the persecution of Jews or to punish him for failing to do so. Instead they sold Japanese war bonds; it has been estimated that this supplied half the cost of the war to Japan. [T]here was a clear recognition that it would be easier to engage American Jewish activists—and to press the Soviet government—by focusing on individual cases. Even when there were more than twenty thousand refusenik families, the thrust of advocacy was on a personalized approach. Names like Anatoly Sharansky, Ida Nudel, Yuli Edelstein, and Vladimir Slepak became watchwords in the American Jewish community. Many American Jews wore bracelets inscribed with these names. The abstract goals of emigration and of Jewish rights became flesh and blood. This organizing tactic mystified the Soviets. In his recent memoir, Stuart Eizenstat says that when Soviet foreign minister Andrei Gromyko came to see President Carter in 1977, Carter confronted him with the Sharansky case. 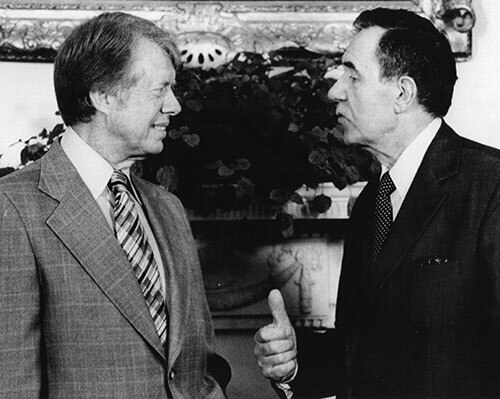 [A]s Carter recalled it, Gromyko dismissed Sharansky as “a microscopic dot” of no importance to anyone. According to [Soviet ambassador to the United States Anatoly] Dobrynin, Gromyko asked the president: “Who is Sharansky?”—and that ended the matter. But in the car after leaving, Gromyko asked Dobrynin: “Who really is Sharansky? Tell me more about him.” Dobrynin did so and discovered that Gromyko had previously instructed his aides not to bother him with such “absurd” matters. To Soviet officials the individual cases of Jewish refuseniks were “absurd,” but calls to change the entire Soviet system by respecting human rights were dangerous. This also created a conundrum for the Soviet Jewish movement: Were they a part of the Soviet human rights movement or a separate Jewish movement with overlapping demands? To put it most pointedly, was the human rights movement an ally or a threat to the far narrower demands of Soviet Jewry? These questions were at the heart of the battle in the Soviet Jewry movement over the “narrow or broad” issue: Was the goal respect for human rights in the USSR, or was it just to get the Jews out? And might one goal undermine the other? The Israeli government thought so and was consequently not very keen on Sharansky, who was the bridge between the two movements. The amendment does not represent interference in the internal affairs of socialist countries, but simply a defense of international law, without which there can be no mutual trust. Adoption of the amendment therefore cannot be a threat to Soviet-American relations. All the more, it would not imperil international détente. . . . The abandonment of a policy of principle would be a betrayal of the thousands of Jews and non-Jews who want to emigrate, of the hundreds in camps and mental hospitals, of the victims of the Berlin Wall. It would be tantamount to total capitulation of democratic principles in the face of blackmail, deceit and violence. Sakharov was arguing that action on human rights was the only way to create a decent Russian regime with which the West could be at peace. This was a debate about whether human rights could have a serious role in the Hobbesian world of international politics. As Sakharov saw, the first problem with realpolitik as a theory of international relations is that it takes states as black boxes. It is uninterested in their internal affairs. But people live in those states, and they act—for example, they risk their lives and their freedom to have the right to learn Hebrew or to emigrate to Israel. This is a key lesson of the Soviet Jewry movement, a reminder never to see Iran or China or any place else as if the only actual entity is a government, a regime, or a dictator and not also a nation consisting of millions of people. relations are a means, not an end. It was never worth sacrificing the freedom of Soviet Jews or the American commitment to human rights to smooth relations with a hostile power. Freedom was more valuable—not only as an abstraction, and not only in its impact on the lives of refuseniks and their families, but in strategic terms. It helped bring about the collapse of the United States’ greatest enemy. Thus, the Soviet Jewry movement, and later Ronald Reagan’s confrontation with the Soviet Union, proved that a freedom strategy was in the end more realistic as a matter of international politics. The Soviet Jewry movement weakened America’s principal enemy where détente had strengthened it. That’s a large claim and hard to prove. Suffice it to say that millions of American Jews worked together and used all the power they had to save and free fellow Jews. What they could not do was work in unity. One might suppose that this would have been a great weakness of the movement, but history shows otherwise. petty turf battles, territorial disputes, character assassinations, and threats coming from National Conference leaders about the Union of Councils burdened the movement overall and prevented necessary cooperation at critical times. There were disagreements about particularism versus universalism, the role of Israel, activism versus old-fashioned shtadlanut (go to the streets or go see Kissinger? ), and the role of the major community organizations as opposed to the newer single-issue groups such as the UCSJ. organizations, like the UCSJ, had only one issue, while the major Jewish organizations had to worry about many interests, including relations with the government of Israel, major donors, and the U.S. government. The major Jewish organizations also had to get along with each other; they had a past and a future together. So, the best outcome may well have been what David Harris of the American Jewish Committee (who was back then Morris Abram’s deputy at the NCSJ) has described as a balagan. That’s Russian (and now Israeli Hebrew) for “a mess”; another good word is “pluralism.” The existence of many different perspectives was probably a secret of the movement’s success. What was necessary was activism, not unity. American Jews relearned in the Soviet Jewry movement what Jews had learned in the 19th century and even the 18th: to think of Jewish interests in terms of American values. In its debate with Nixon and Kissinger, the movement was quite correct in arguing its case in terms of American interests and principles—exactly as Jackson did in his amendment, whose text said nothing about Jews but instead backed freedom of emigration as a basic human right. Thus, the Soviet Jewry movement in the United States rightly presented itself not as struggling for Jewish rights but as working for human rights of the sort all Americans believe in. The “narrow or broad” debate was a serious one for Soviet Jews: Should they seek the right of Jews to emigrate or all the human rights that were guaranteed by the UN’s Universal Declaration of Human Rights, the Helsinki Accords, and even the Soviet constitution? But for American Jews this wasn’t a hard question. What was far more difficult was dealing with the complex role the state of Israel played in this entire drama. Israel pressed very hard not for the general right to emigrate but for the right to emigrate to Israel, while most American groups believed in the absolute right to select one’s own destination. From the Zionist perspective, Jews who fled the USSR were not stateless “refugees”; they were Jews being repatriated to their homeland. There were other Israeli state interests at stake as well. As Sharansky put it, “Israeli leaders, and [the] Israeli establishment, were afraid to irritate the Soviet Union, and were afraid of public pressure coming from Israel.” As well they might have been: Israel was a tiny, endangered state facing a hostile superpower. In short, the Jewish state is a state, has state interests, and pursues those interests, which do not perfectly align with the interests of any other state or with those of Jews living in the diaspora. We should not then be shocked when it pursues those interests. That’s not a crisis, nor is it a disappointment or a sign that something is wrong with Israeli foreign policy. That is the kind of realism in foreign policy that we should understand. States will inevitably pursue state interests, but those interests must still be cogently defined. Natalia Stieglitz, and the following day she left for Israel because her exit visa was about to run out. He was supposed to follow in a few months, but, after a series of arrests, he was tried in 1977 for treason and sentenced to 13 years in the Gulag. Sharansky was the key middleman between the Soviet human rights and Jewish emigration movements, the personification of the linkage that Israel feared would both slow emigration and make Soviet rulers furious at the Jewish state. When Sharansky was sent off to Siberia, his young wife (now called Avital) was advised by some Israeli officials to divorce him and find someone new in Israel. No doubt, they thought they were advancing national interests, but they had it all wrong: Support for Sharansky was obviously Israel’s most realistic path. In 1986, he was freed from prison and reunited with his wife. A few years later, the Soviet Union disintegrated. [F]or us Jews there is no choice but to undertake an open campaign and maintain open pressure on behalf of Soviet Jews. While President Reagan can use quiet diplomacy, American Jews should not take this approach. This was the error Kissinger made, or part of it: He seemed to think that because diplomacy might work for him it was therefore also the way the Jewish community should act. That’s wrong. Governments should act like governments, and Jewish organizations should act like Jewish organizations, including creating balagans. Here the lesson for our students is that officials and experts do not know everything and too often do not have enough skin in the game. The UCSJ always listened first to Soviet Jewish activists, not other American Jewish organizations or politicians and diplomats. The Israeli government had its own ideas; the Russian Jews knew better. confronting the USSR. They were wrong, and Sharansky was right. At its best, the American Jewish movement to free Soviet Jewry backed amazingly courageous Soviet citizens who had to set the pace and make the most of the key decisions. The American Jewish role was crucial, but it achieved the most when it backed the goals and strategies of Soviet Jews. It isn’t surprising that the Soviet Jewry movement gets a great deal less attention than the Holocaust, but it is striking that it gets almost none at all. There are important lessons to be learned about politics, policy, and Jewish history from taking a close look at the 30-year struggle to free Soviet Jewry. The story should be remembered, understood, and retold. Elliott Abrams served in foreign policy positions for Presidents Ronald Reagan and George W. Bush and was recently appointed Special Representative for Venezuela in the State Department. His most recent book is Realism and Democracy: American Foreign Policy After the Arab Spring (Cambridge University Press). Whoops! What Mr. Abrams omitted is that if he wishes the Soviet Jewry movement to be taught to students today, he has to discuss the leading role of students in the Soviet Jewry movement, such as the Student Struggle for Soviet Jewry. We did not have the genetic caution of government or deference to the Jewish Establishment that our parents had. We had the experience of the American civil rights and anti-war movements, and we created activism unique to our determination not to repeat the silence of the previous generation during the Shoah. The protest sign slogans which Mr. Abrams with the Jewish Defense League actually were those of the SSSJ. So I strongly suggest to Mr. Abrams to re-edit his remarks. 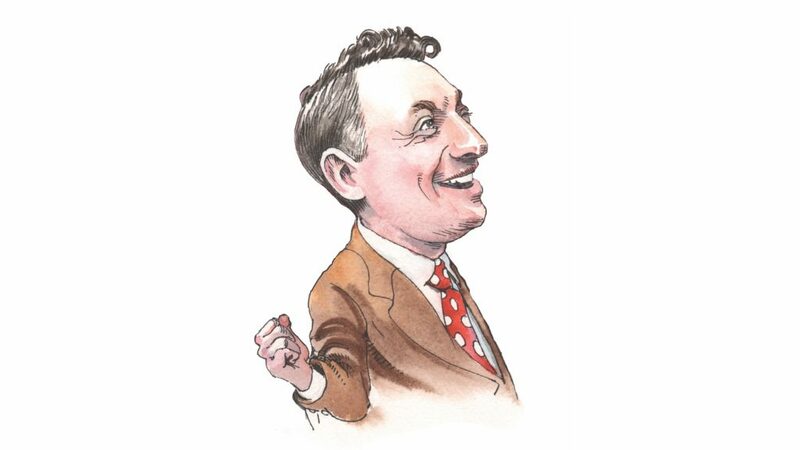 Many authors have passionate readers, but few have drawn as many self-consciously nutty fans as Saul Bellow.